Since the 1980s, Medha Patkar has been one of the top environmental activists from India, engaging initially with the Narmada Bachao Andolan against dams (movement to save the River Narmada and the tribal groups along it course), and later leading the NAPM (National Alliance of People’s Movements). She studied sciences in Mumbai and has a master in Social Work but she left academic and bourgeois life long ago. She has travelled all over India, supporting local socio-environmental movements and also slum dwellers against evictions, from the train to demonstrations and hunger strikes, and back again and again. The communist party leader, Prakash Karat, who dislikes environmentalists, classified her in 2007 at the time of the peasant fights against land-grabbing in West Bengal (Nandigram and Singur) as a member of “the single issue crowd” and as a “late-day Narodnik”. He thought these were adequate insults against activists like her who oppose mining projects, new roads, car factories or chemical hubs in densely populated agricultural land, and nuclear power. Medha Patkar strongly supported the anti-corruption movement led by Anna Hazare in 2011 and 2012 in the streets of Delhi from which the AAP party was born led by the Arvind Kejriwal, Yogendra Yadav and other activists and professionals mostly from Delhi and Haryana who were successful in the regional elections in Delhi in December 2013. Arvind Kejriwal became head of the regional government in Delhi in January and February 2014, but resigned in February 14 because he had no enough votes with only the AAP members of the regional assembly to pass an anti-corruption law. Here we have now with Medha Patkar a world-famous woman environmental activist not from the north of India but from Maharashtra turning into a member of a political party whose top leadership has been formed by younger men so far. 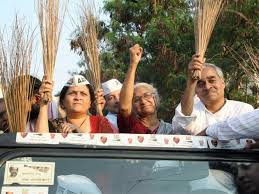 For several reasons, the entry of Medha Patkar in the party has awoken praise and also criticism from many quarters. It certainly means an enormous reinforcement for the AAP. She received long ago the highest honours from the global environmental justice movement, the Goldman prize and the Right Livelihood award. She was a member of the World Commission on Dams that reported in 2000. She will be 60 years old at the end of 2014, perhaps already as a member of parliament (the Lok Sabha) as a successful candidate from Mumbai North-East for the AAP. For this new party formed by civil society activists (now contesting the national elections in April-May 2014 on an anti-corruption platform) the fact that Medha Patkar joined, supports the view that one can form a political party whose backbone will be the myriad local movements of Gandhian inspiration that up to now have criticized political parties from outside. Many questions arise. Will the new party swallow up the movements? Will the former activists now get involved in the usual fights in political parties on who is a candidate, who becomes a minister, distancing themselves from their previous struggles in support of poor people and the environment in the countryside and in the cities? Are not political parties oligarchic by nature? Moreover, will the AAP leave successfully aside the strong realities of caste, region, religion in India, or will it be able to incorporate them in a way that attacks the political use made of them by the right-wing Hinduist BJP and other parties? How will the AAP, if it has a strong presence in Parliament, deal with issues such as the repression in Kashmir, the Naxalite insurrection in central India, the relations with Pakistan, and climate justice at world level? Which economic policy will it have? Amartya Sen has expressed sympathy towards the AAP, so that perhaps a social democratic anti-poverty policy (a “capabilities” approach from Sen) together with an “environmentalism of the poor” line (from Medha Patkar) might prevail in the AAP. The victory in the 2014 elections will probably go, however, to the BJP party, led by Narendra Modi. Will environmentalists such as Medha Patkar be able to work with business people who are against crony-capitalism and corruption, but not against capitalism, and who are joining the AAP? Finally, will the environmentalists in the AAP, already a noticeable and perhaps increasingly influential minority, be able to impose a RED party line (“RED” meaning here Radical Ecological Democracy, as in Aseem Shrivastava’s and Asish Kothari’s remarkable book, Churning the Earth: the making of global India)?